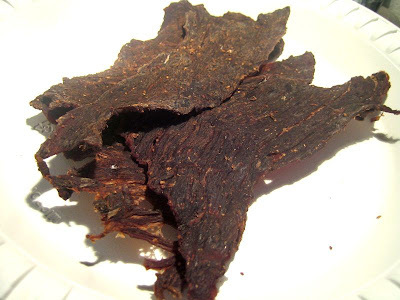 Terms like "Cowboy Jerky" and "Cowboy Style" are used often to describe old fashioned jerky, the kind of stuff that you might expect an weathered old cowboy to gnaw on while driving cattle through the dusty prairies of Wyoming. It's typically peppered, salted, smoked, dry, and chewy, and free of any sweeteners, like something a "real man" would eat. And "Cowboy Style" is one of the many offerings from Fatman's Beef Jerky. Fatman's was launched by the husband and wife team of Rick and Ellen Robey of Roswell, NM, through their company, Red Meat Foods, LLC. Rick had previously owned and operated a holstein calf raising business and a USDA inspected packing plant. That gave him a good head start into the jerky making business. All of Rick's jerky is made at his facility using his own recipes. He uses only American-raised beef, and marinates it for 24 hours. The Fatman's brand was launched in 2006 and it's products are sold in stores mostly throughout the desert south-west region of the USA, and through their website, with sales topping $300,000 in its first year. Beef, water, soy sauce, worcestershire sauce, liquid smoke, onion, salt, garlic salt, seasoned salt (salt, sugar, paprika, tumeric, onion, cornstarch, garlic, tricalcium phosphate, natural flavor, extractives of paprika), black pepper. The first taste from the surface to hit my tongue is a slight smokiness, and the aroma of beef. I can also detect a saucy, and slightly fishy taste, which is likely the worcestershire sauce. Moving into the chewing, the natural meat flavors leech out, and I can also pick up a faint taste of soy sauce from the juices. The predominant taste in this jerky is the natural meat flavors. It's easily identifiable, and easily steals the show. It has a strong steak-like taste, enhanced by its slight smoky flavoring. And for being free of preservatives, it still retains a fresh taste. 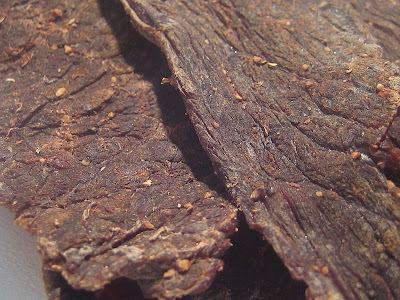 If you consider cowboys these days have worn their taste buds down from the strong coffees and tobacco chewing, they need a jerky with an equally strong taste of beef to register with the few sensory nerves left on their tongues. The worcestershire sauce is noticeable in this, but slightly. The teriyaki variety that Fatman's offers also has worcestershire sauce, but it can't be detected due to the other seasonings. But because this Cowboy Style is very lighly seasoned, I can taste a hint of it. I can sense a trace of the anchovy this worcestershire sauce contains. The amount of black pepper on this is slight, but still enough to be noticed. It's mostly there to help frame the natural meat flavors. The saltiness is moderate. There's also a faint amount of sweetness off the surface of these pieces, which is from the worcestershire sauce. And the soy sauce I mentioned earlier is also faint, but is only found during the chew after sucking out some juice. I can actually smell the soy sauce more than I can taste. So, for being marketed as "cowboy style", is this something that a cattle-drive cook would make for the guys? Yes, I think so. It definitely has an "old fashioned" taste if you can imagine such a thing. Very meaty taste, with seasonings and marinades that seemingly has a more masculine appeal. I'm guessing if the "Duke" himself, John Wayne, could find a snack food that satisfies his "meat tooth", but doesn't challenge his alpha-male personality, this might be it. Overall, this is actually a really good jerky. It puts all the emphasis on the natural meat flavors, but uses the spices and marinades to frame that flavor, not compete against it. All of the slight and faint flavors I mentioned will provide enough complexity to keep your brain working. This is a thin dry jerky, being fairly brittle, and even slightly crunchy. For that matter, it's easy to break off a piece. It chews fairly easily and chews like a real steak. In fact, it feels like real jerky. That is, it's rough and dry, not smooth and shiny like many jerkies can be. I found the jerky to be rather clean, not leaving my fingers with any residue. The light amount of black pepper does fall off on to my desk and lap, however. Otherwise, I found only a tiny bit of fat on one piece, but no tendon or gristle. For general jerky snacking purposes, this presents a good value. You're getting a great tasting jerky, with a great meat consistency, and easy to eat. That all contributes to a wonderful jerky snacking experience. It's just higher price range that keeps this from being a better value. As a cowboy style of jerky, I think it's provides great value. First, you're not going to find much jerky billed as "Cowboy Style", and second, I think this actually does resemble something that you might expect to find out of the old west. 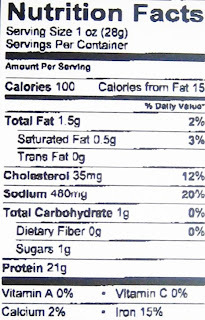 It's largely the excellent tasting natural meat flavors that this jerky emphasizes that warrants the best rating. It's further bolstered by the light seasonings, and complexity of those seasonings, that frames the meat taste really well. And when you throw in the excellent meat consistency and ease in eating, this becomes a solid winner. This is probably also a jerky that Fatman's might want to consider getting into the asian markets. There's a niche of USA-based jerky manufacturers who exploit a base of meat-snackers in Japan who've fallen in love with the American old west. All Fatman's needs to do is spruce up the label with a photo of a rugged looking cowboy gnawing a piece of jerky, similar to the Marlboro Man. I think a good beer is something light on flavor that won't get in the way of the jerky, like a blonde ale. I just received my first order, a full pound and now I'm wishing I had ordered two. Excellent and very true to the critique provided by Steve. Spot on! I bought a variety pack from Fatman's. When I first cut into the bag and pulled out a piece, I noticed that this was the driest variety of jerky I'd ever had. I actually didn't expect to like it, but after tasting it, I knew immediately that this was an excellent and special jerky. In fact, it's my favorite band of the 6-7 or so of top varieties I've ordered. The Cowboy jerky I remember to be rather spicy. It has a very bold flavor that the Original variety lacks. I enjoyed all the other flavors as well, though none had such a pronounced bold flavor as the Cowboy jerky. I think Fatman has a great thing going with this jerky, and it's one that I'll certainly be ordering again. I ordered several bags and ate them all very quickly!